In the age of smart, connected customers, the demand for customized and personalized customer experience continues to rise across the industries. A number of customer experience-related trends are relatively gathering steam, further raising the bar for companies to innovate products and services that deliver satisfactory experiences. Essentially, customer experience design is gaining traction. Most customer-centric organizations have embraced the process of designing excellent experiences—testing solutions and iterating improvements before scaling. In addition, organizations are placing the customer at the heart of their strategies and rethinking their models of engagement. They are reviving their brands across all of the interaction points, looking beyond multi-channel to omni-channel, converging digital experiences with physical experiences and finally using insights into the customer’s behavior to develop a personalized meaningful relationship. These solutions are developed around customer’s specific needs and equipped with new technologies such as big data, analytics, and cloud amongst others that provide strategies, process models, and information technology to design, manage, and optimize the end-to-end customer experience process. In the last few months, we have reviewed hundreds of CEM providers and shortlisted some of the pioneering companies who have helped their customers tackle the challenges related to customer experience management. The companies featured here provide a look into how their products work in the real world so that you can gain a comprehensive understanding of what technologies are available, what is right for you and how they transform the CEM landscape. 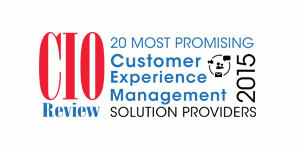 We present to you CIOReview’s 20 Most Promising CEM Solution Providers of 2015.